January 20th – it’s a holiday! There’s no school for many of us, we get to sleep in and procrastinate on that history paper a little longer! Not exactly. January 20th is Martin Luther King Jr. Day, a day set aside to celebrate the work and legacy of Dr. King. It is also the National Day of Service, a day to yes, take off school, but also to serve others the way King did. At the Global Youth Village, we talk a lot about universal values, things that all people across the world believe are important to living a good life. These values are things that bring us together, even despite our differences. One of these values is service. Service is something that all of us can do; whether it’s volunteering at the local soup kitchen, planting a community garden, or even giving your Grandma a call on the phone. Serving doesn’t have to take a lot of time, a lot of money, or involve a lot of people. Just do one small thing that makes someone else’s day a little better. Through serving that way, we become closer to people, and the world become a little friendlier. 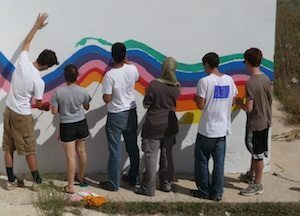 That is what the Global Youth Village is all about – bringing young people together, teaching them to serve each other and their communities and making the world a more connected, friendlier place. We do that through our workshops, teaching practical skills, like how to plan a community volunteer project and how to listen to people, even when you don’t want to hear what they have to say. But mostly we do it through the spirit and attitude that has lived on our campus for 35 years, a spirit of giving, an attitude of caring and true belief that serving others brings us closer together. “Everybody can be great, because anybody can serve. You don’t have to have a college degree to serve. You don’t have to make your subject and verb agree to serve. You only need a heart full of grace. A soul generated by love.” So get out next Monday, the day you don’t have to study grammar in school, go do some good. Even better, be great and serve! A day of service in Washington, DC, helps those hit hardest by cold winter weather. Hosted by Meridian International, who partners with the Global Youth Village in the Iraqi Youth Leadership program, the day kicks off with a “Knit-In” – any knitters out there?! ?